NASA 3D Resources – NASA maintains a collection of space related 3D models, textures, and images, some of which are 3D printable. National Institute of Health 3D Print Exchange – A database of scientific and medial 3D models such as bacteria, body parts, organs, cells, organisms, and labware. There are curated collections for prosthetics, neuroscience, and more. Sketchfab – Purchase 3D models or publish your own. Many models can be 3D printed, but also can be displayed online or for VR headsets. The British Museum curates a collection of its scanned artifacts on this site. Smithsonian 3D Program – The Smithsonian Museum is working to digitize artifacts from their collection, and has started putting some of these online. The website also includes educator resources and some fascinating videos of how the museum uses 3D and other technology to document and explore objects. Yeggi – A meta-search engine helps find 3D models across multiple sites. YouMagine – A database of open source 3D designs for print. Started by the founders of the 3D printer company Ultimaker. e-NABLE – A global exchange to match people with fabrication devices with people who need prosthetics and can’t afford them. Matterhackers – Software, projects, and equipment for fabrication. The Free 3D Models – Large and varied database of 3D models, but contrary to the name, they are not all free. Categories include vehicles, characters, architectural objects, furniture, animals, plants, food, and more. GrabCAD – Engineering and mechanical design oriented 3D model repository. Instructables Introduction to 3D printing – Simple introduction to 3D printing with many photographs. 3D Printing News – News articles about global 3D fabrication in industry, medicine, art, and more. How to Store 3D Printing Filament – Suggestions for storing 3D printer filament to make sure it lasts. Ultimaker – The 3D printer manufacturer Ultimaker offers resources, curriculum, and an engaged, global community for 3D printing in classrooms and makerspaces. Formlabs – The 3D printer manufacturer Formlabs has a very good overview of 3D printing and applications in education, medicine, manufacturing and more. The tutorials are also a goldmine of information about things like scanning, reverse engineering, and prototyping. Makerbot – The Makerbot site offers good introductory material about 3D fabrication. The educator section has a free guide, lesson plans, and NGSS alignments. 3D Printing Projects – A user friendly family guide to 3D printing from DK. Functional Design for 3D Printing: Designing 3D Printed Things for Everyday Use – Learn design practices that result in durable, functional objects that print reliably. 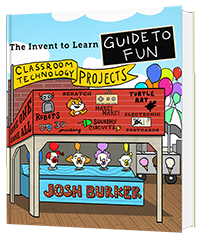 The Invent to Learn Guide to 3D Printing in the Classroom: Recipes for Success – by David Thornburg, Norma Thornburg, and Sara Armstrong. This book is an essential guide for educators interested in bringing the amazing world of 3D printing to their classrooms. Laser Cutting Basics – Instructables illustrated guide to getting started with laser cutters. Guide to Laser Cutting in Education – This brochure from Epilog is an overview of how laser cutters are used in school makerspaces. Laser Cutter E-books – Free e-books about using laser cutters from Obrary, a design website. Cricut – A variety of cutters and resources for home and education. Silhouette cutters – A variety of cutters and resources for home and education. Roland – Vinyl cutter manufacturer. US Cutter – Vinyl cutter manufacturer. Carvey – Computer controlled desktop carving machine for classrooms and makerspaces. Site includes many project ideas. Tinkercad – A free, easy to use, online Computer-Aided-Design (CAD) program. It is a favorite of many schools for its friendly interface, tutorials, and is free. One of the Autodesk line of 3D modeling programs. SketchUp – A free, easy to use 3D modeling program. There is an online warehouse of models to download or contribute to. Fusion 360 – Autodesk 3D CAD/CAM design software for students, educators, and academic institutions. Autodesk Student Software Licenses – Autodesk publishes a wide range of professional CAD and 3D design software tools. They have free student licenses with minor restrictions for many of them. Adobe Illustrator – Vector graphics software. Inkscape – Free open source vector graphics software. MeshLab – Free, open source software for editing 3D meshes. Morphi – A 3D design app for 3D printing and Augmented Reality. Requires a paid subscription. Beetle Blocks – Visual code for 3D design in the Logo tradition. Free and runs in the browser. Turtlestitch – A version of Snap! that outputs files for embroidery machines. Printcraft – Print your Minecraft creations on a 3D printer. Makers Empire – Easy to use software for 3D modeling, design, and printing. Tools for teacher management of student projects. Works on tablets, Macs, and PCs. The app itself is free, but additional features are not. Blender – Blender is a widely used open source 3D creation tool, free to use for any purpose and supported by a worldwide developer and user community. Blender has a high learning curve but may interest students who are fans of 3D animation or video games. Maya – Autodesk 3D animation, modeling, and simulation software. Corel Draw – All-in-one graphic design software offers home/school licenses, tutorials, and project ideas. FreeCAD – 3D parametric modeling software. Free and open source. BlocksCAD – Cloud-based, free programmable 3D modeling software with a block-based interface. OpenSCad – Free software for creating parametric 3D models. Meshmixer – Autodesk software to clean up meshes for 3D printing. Free. Sculptris – Virtual sculpting software. Free. SolidWorks for Kids – SolidWorks Apps for Kids is a set of web apps for 3D designing and printing. Shapeways – Upload a design and it will be printed and delivered to you. Also offers a community and marketplace to sell your own designs. Sculpteo – Print your 3D object or get an object laser cut in a variety of materials. Browse designer collections or open a 3D object store. Offers plugins for SketchUp and Blender. Ponoko – Create your own design or modify someone else’s with an easy to use “Personal Factory.” Your object will be delivered to you in plastic, wood, metal, ceramics, acrylic, or other materials. 3D Hubs – Global network of local 3D print facilities. i.materialize – Belgium-based 3D printing with world-wide shipping. Also has an extensive shop for designed objects.